For a nation so small in population, Australia has made an exceptional contribution to children’s literature. Amongst this wealth of literature the best known examples are international exports like Dorothy Wall’s Blinky Bill, and May Gibb’s Snugglepot and Cuddlepie, Possum Magic by Mem Fox and Julie Vivas and Animalia by Graeme Base, all of whom have their own delightfully Aussie mark on the imaginative minds of young readers worldwide. 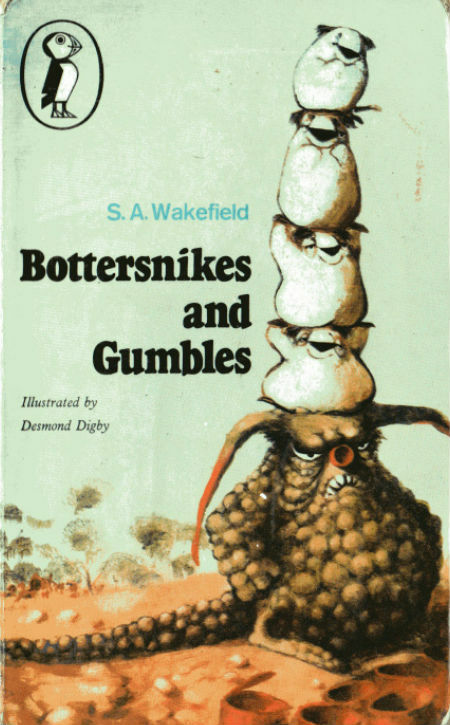 One series that may not be as well known but deserves to be is S. A. Wakefield’s Bottersnikes and Gumbles (illustrated by Desmond Digby), one of the mainstays of my childhood, which thanks to my parents commitment to literacy in general, but Australian stories in particular, made quite an impression on me. Much of that had to do with the fact that, cuteness aside (and both the Bottersnikes and the Gumbles are endearingly cute), the series carried with a strong environmental message. Keep in mind that the books, published between 1967 and 1989, arrived at the start of the environmental movement, and to a nascent would-be conservationist as myself, they really struck a chord. I was one of those outlier kids who worried about what we were doing to the environment, yes even then, spurred on by the likes of Gerald Durrell, an animal hunter-turned-conservationist, whose books I bought in their entirety (a big deal since that was all out of my pocket money which wasn’t extravagent and had to be very carefully managed) and whose message of preserving nature really hit home. It helped, of course, that this important message was delivered in the form of engaging, typically Aussie storytelling by characters you couldn’t help but fall in love with. No surprise then that a TV series was developed in 2012 and aired in 2015-2016 as 52 short-and-snappy eleven episodes on commercial channel 7 here in Australia and Netflix in the US. It was genius move in many respects, not least because it put these adorable creatures with a conscience – well the Gumbles anyway – firmly back into the zeitgeist but because it also rode a renewed appreciation that the environment was not some elastic entity we could use and abuse forever without penalty. Kids especially are attuned to this, and while the modern instinct is to shield kids from harsh realities, the fact is they can cope with things like environmental degradation if you give them an accessible framework in which to do it. Bottersnikes and Gumbles is the perfect vehicle – cute and approachable but pulling no punches when it comes to the real impact of our presence here on the planet. The good thing that the series, both in book and TV form, offers hope and solutions, an important thing for people of any age but especially kids who need to know that something can be done. That was certainly the effect the books had on me way when, and I marched forth emboldened by these lovable characters – yes, both of them; I am nothing if not an equally opportunity appreciator of characters – believing I could make a difference. The best part was that this rallying cry also hugely entertained me and endeared Bottersnikes and Gumbles to me in a way that remains with me still all these years later, and which continues to delight, and yes, inspire me. Not bad for a bunch of diminutive bush denizens is it?